What's left behind Thanksgiving dinner? Too much stuffing for one, a few links of sausage that didn't make it into the recipe and, if you're lucky, some eggs. While it's simple enough to finish off the turkey piled high in sandwiches or simmered into a broth for soup, it's the stuffing that stumps me. After all the chopping of celery, onions, carrots and the peeling of chestnuts, I hate to through the stuff out. Here's the easiest brunch dish ever -- stuffing coddled eggs. After the feast, eggs are not the only thing to coddled. Serve them up then snuggle in with a book or a ball game. The best of Thanksgiving is the remains of the day. Check out this link for more leftover Thanksgiving Day recipes and relax! Set a 12-inch skillet over medium heat and film with oil or melt the butter. Cook the sausage pieces until no longer pink, about 5 minutes. Add the sausage and spread evenly over the pan. Cover to heat through, about 2 minutes. Crack the eggs over the sausage, cover and cook until the yolks are set, about 2 to 3 minutes. 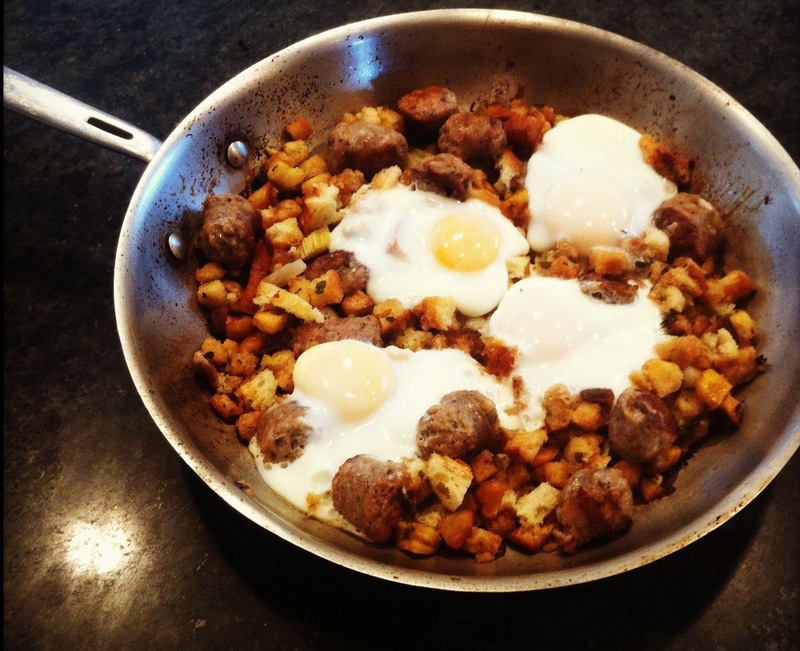 Serve the eggs with the sausage and stuffing. Great post!! Very interesting reading thanks. I shall bookmark this site! It quotes is very latest things. This is very nice post! I will bookmark this blog. Looking for Gold coast kitchens? We exclusive accumulation in top wellborn Gold coast kitchens that junction unitedly to create the nonpareil fourpenny kitchen. Find the best Gold coast kitchens today.